Noriko Shinohara could have done anything when she arrived in New York City as a 19-year-old art student. She chose to devote her life to avant-garde artist Ushio Shinohara, 22 years her senior and famous for his “boxing” paintings. 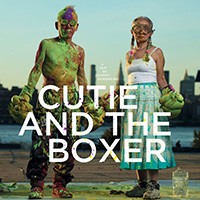 Their 40-year marriage, plagued by alcoholism, an unstable lifestyle, and the sacrifices required to create their art, is chronicled in the Oscar-nominated documentary Cutie and the Boxer. In her series of drawings “Cutie and Bullie” Noriko fictionalizes her relationship with Ushio. Her drawings, which come to life through animation, serve as the film’s inventive narrative device. They add depth and emotion to the couple’s story, despite the occasional tragic circumstances that are depicted. What translates is a sense of love in the fullest. “I’d never known anyone in my life who was so open-hearted,” Noriko says about Ushio in the documentary. “I began to love him. I was so filled with inspiration. I was never worried about the future.” Filmmaker Zachary Heinzerling says he was “impressed by the authenticity and environment” of the Shinoharas. Heinzerling—who won the Best Directing Award at the 2013 Sundance Film Festival—was first attracted to their story after he met Ushio and Noriko in 2009. To Heinzerling, the Shinoharas are the last of a dying breed. At one point, Ushio says he wants an exhibition of his to be like a dinosaur’s roar, able to capture the viewer’s attention in an instant. The allusion to a dinosaur seems an apt description of the Shinoharas: nearly extinct but strong enough for one last roar. Heinzerling has managed to capture the beauty of the Shinoharas’ relationship; even their conflicts create beauty. “It was a universal story that anyone could relate to,” Heinzerling says. “But one time recently, this one guy told me, ‘You must be rich and famous,’ and that was quite a surprise for me,” Ushio says. Even with all the critical acclaim for his art, he and Noriko live a life of near poverty. “This is a very unusual lifestyle that most people won’t take,” Heinzerling says. “I think that some would call it brave, silly, or unconventional—one that’s not worth all the sacrifice.” Heinzerling believes that Ushio and Noriko’s struggles fuel their creative fervor. “As an artist, I never finish,” Noriko says, echoing her husband. “Perfect never exists.” Instead of being discouraged by this thought, it encourages Noriko to continue drawing and painting and looking for new ideas. Cutie and the Boxer celebrates its BLU-RAY and DVD release on Tuesday, February 4. The film is also available for streaming online via Netflix.